Protesters march North on State Street to express their disapproval of the election of Donald Trump as the 45th president of the United States, Wednesday, Nov. 9, 2016 in Chicago. 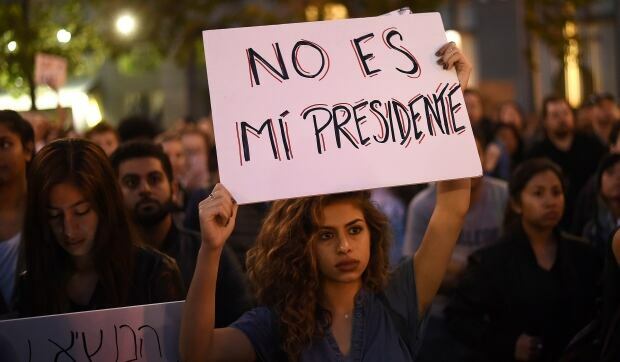 Thousands of demonstrators held marches across the United States on Wednesday to protest Republican Donald Trump’s surprise victory in the U.S. presidential election, blasting his campaign rhetoric about Immigrants, Latin Americans, Muslims and other. Trump, 70, was elected the next president, upending most predictions and rising to the nation’s highest office despite several controversial statements during his 18 months campaigning. Chicago police closed roads in the area, blocking the demonstrators’ path. He said he would encourage Trump to listen to these voices and tell them to wait a year. “Calm down, things are not as bad as you think,” Giuliani said. Giuliani is widely expected to get a major position in the Trump administration. A second round of protests was planned across the U.S. on Thursday, including an anti-Trump rally at New York City’s Union Square Park, in Washington D.C., Baltimore, at the University of Wisconsin and elsewhere. More demonstrations are planned heading into the weekend, according to organizers’ online posts. One urged protesters to rally in Washington, D.C., on Inauguration Day, Jan. 20. Protesters railed against Trump’s marquee campaign pledge to build a wall along the border with Mexico to keep out undocumented immigrants and other policies perceived as affecting people of colour. “I’m particularly concerned about the rise of white nationalism and this is to show my support against that type of thing,” Rizzo said. President Barack Obama welcomed his successor to the White House today, extending an olive branch to a man he blasted as unfit to serve as commander-in-chief and who led the charge to challenge the legitimacy of his own presidency. A young woman holds a sign while marching in protest to the election of Republican Donald Trump as President of the United States in Berkeley, California. Protests also broke out in cities including Oakland, Calif., Portland, Ore., Pittsburgh, Seattle, Philadelphia, Boston, Kansas City, Los Angeles, Minnesota and Austin, Texas. On Twitter, the hashtag “#NotMyPresident” had been used almost half a million times. 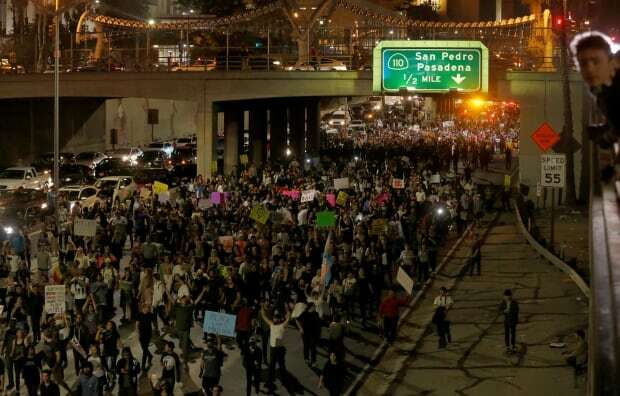 The protesters, who had remained peaceful and not overly disruptive for most of the night, poured on to U.S. 101, which links downtown L.A. to Hollywood, and stayed there for most of an hour. Drivers sat and waited. Many got out of their cars. The crowd was slowly starting to disperse as many of the demonstrators left the freeway and others were taken into police custody. There was no violence between officers and protesters.